Sprawled over coastal hills just an hour and a half from Santiago, the city of Valparaiso is known as the San Francisco of South America thanks to its colorful houses, bohemian lifestyle, world-class street art, and steep, winding roads and stairways that lead up into the hills. Its past as an important port city, unique culture, and architecture, and reputation as a haven for visual and performing artists earned it the distinction of being a UNESCO World Heritage Site in 2003, and it’s one of the top places to visit in Chile. 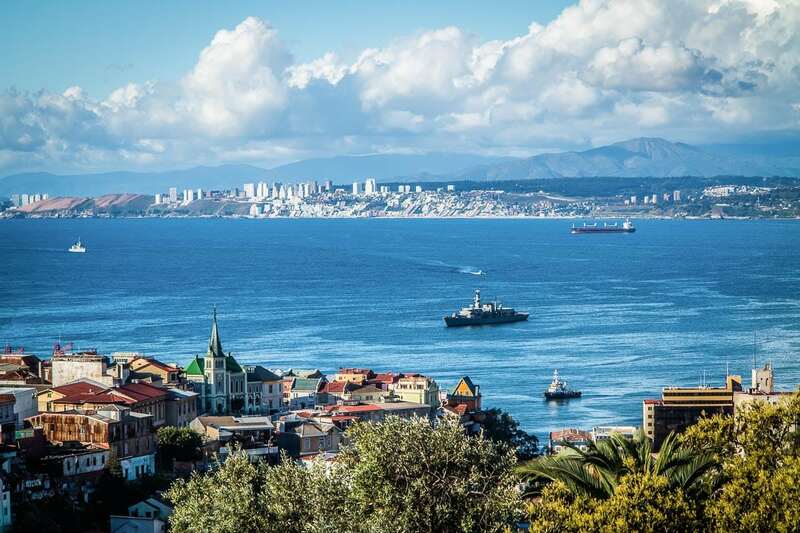 Although it’s recommended to stay for a few days to allow you plenty of time to explore the city at your leisure, with our Valparaiso and Wines Day Tour it’s easy to see the best of this Jewel of the Pacific in just a day! 1. 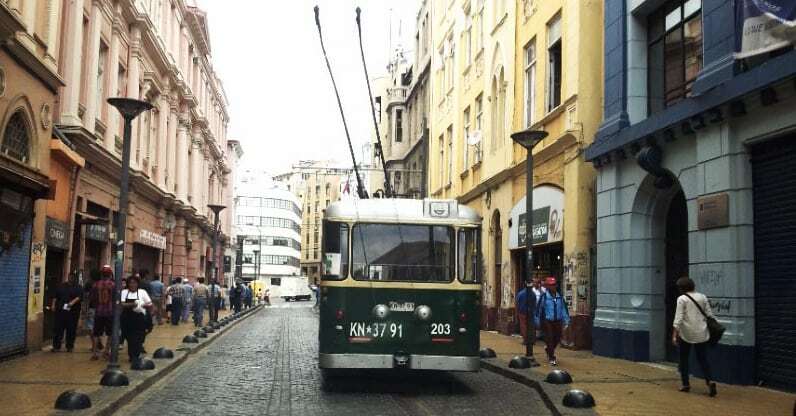 Go for a ride on a trolley bus – While wandering the streets of the city, you’re bound to see these low-slung, cream and green electric cable cars lumbering along as their connector cables crackle and twang with electricity, the interior of the cars lined with worn leather seats and lit by warm, amber lights. They look like something straight out of the 1950s, a relic of a bygone time. They’re Valparaiso’s famous troles (trolleybuses). The second oldest streetcar system in South America, the majority of the streetcars were made by the Pullman-Standard Company and their historical significance helped gain the city its UNESCO World Heritage Site designation. Hop on board at the bus depot on Avenida Alemania, pay 270 pesos (about 50 cents USD), and then enjoy the ride through the streets, passing by city landmarks like the Turri Clock, Plaza Victoria, and Plaza Sotomayor with the Naval Building. 2. 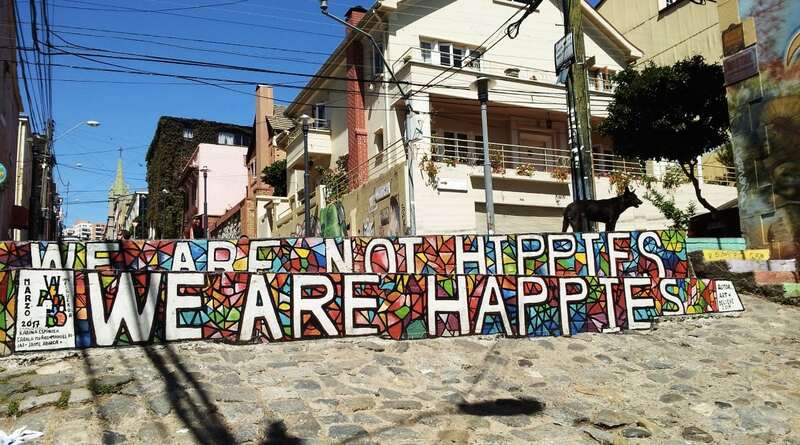 Walk around to see the street art – Valparaiso is the capital of Chilean street art, and the best examples can be found covering the walls of Cerros Alegre and Concepcion. Wander along the cobblestone streets for an afternoon and you’ll see everything from giant hummingbirds, to a staircase, painted like piano keys, to the famous “We are not hippies, we are happies” mural, to a stylistic tribute to Vincent Van Gogh. Artists come from all over Chile and the world to contribute murals in a wide variety of styles done with bright, exuberant colors, and there are always new pieces to discover. You can also go explore the Open Air Museum of Cerro Bellavista, just down the hill from Pablo Neruda’s house, where you can see 20 outsize and vibrant murals created by artists from Chile and other countries in South America. 3. 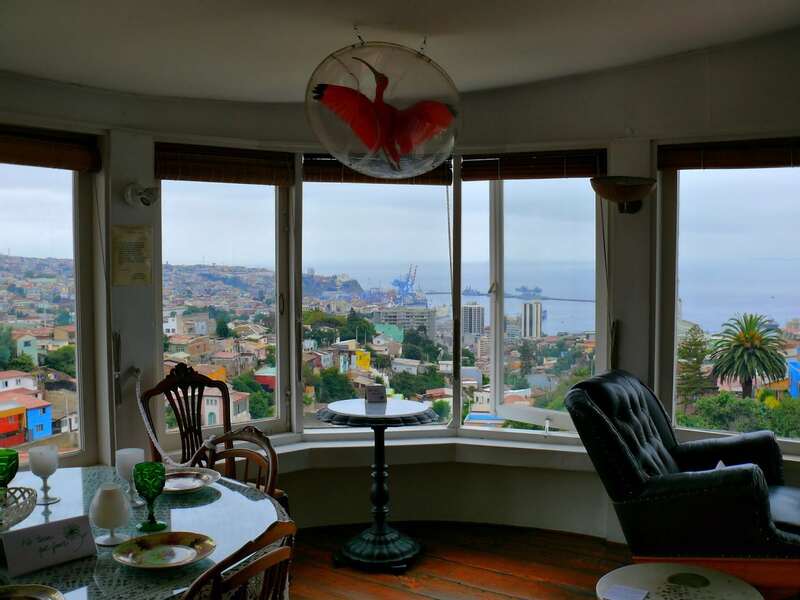 Explore Cerro Alegre and Cerro Concepcion – These two hills are the most popular to visit in Valparaiso because they’re home to some of the best examples of Valparaiso architecture. The houses – which are covered in corrugated iron that’s been painted in bright colors – are built in a German/European style that becomes popular in the city after the huge influx of immigrants from Europe in the 1800s. All the houses are intersected by hidden alleyways and staircases full of cafes, galleries, shops, and street art, and you can wander the hills for hours and still not see every part of them. From the lookouts at Paseo Gervasoni and Paseo Atkinson, you can also see stunning views of the ocean and the surrounding hills. 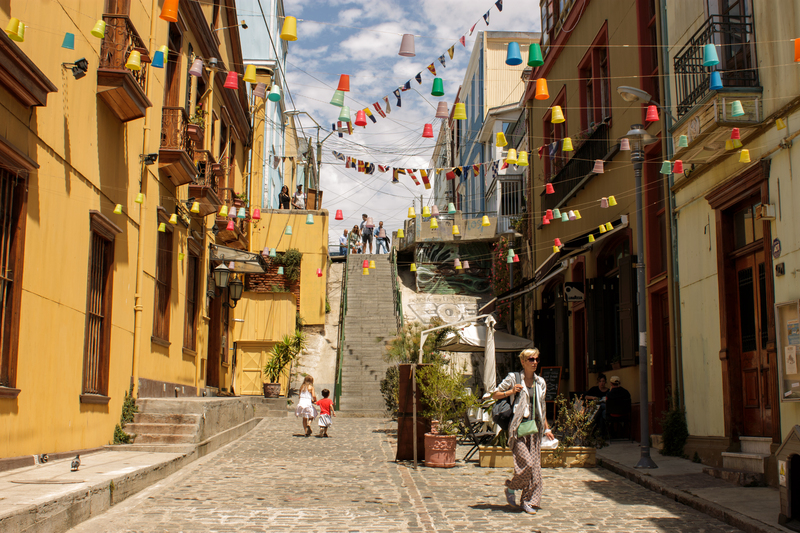 If you are looking for a place to experience every part of Valparaiso – the art, the bohemian culture, the colorful houses – this is the place to explore. 4. 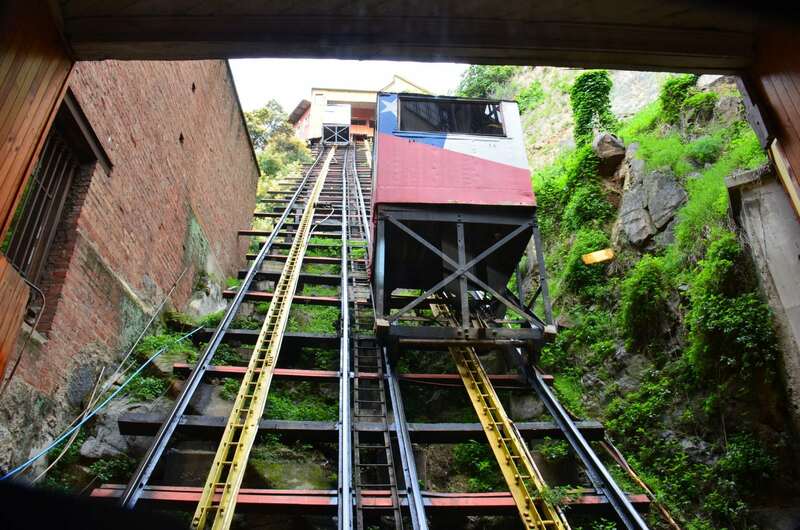 Ride up and down the hills on a funicular – One of the icons of Valparaiso are its funicular elevators. The cars, which are pulled up and down the hills on their tracks by pulleys, are often painted in flashy colors to match the houses of the city, or done up with street art instead. For about 100 pesos (16 cents USD), you can take the short ride up or down one of the hills, with the elevation opening up beautiful views of the surroundings. In the past, the city has had as many as 26 working funiculars operating throughout the city, but nowadays, only the ones on the most popular hills are maintained. Two of the most popular, La Reina and La Peral, can be found on Cerro Alegre. 5. Visit Pablo Neruda’s house – “Valparaiso, what nonsense you are, what a crazy, insane port.” Thus starts Pablo Neruda’s ode to his beloved port city, where he chose to keep one of his three homes. Known as La Sebastiana, the multi-story house teeters on Cerro Florida overlooking the bay, its many floors chock-full of whimsical items Neruda acquired during his travels, like a wooden horse taken from a carousel in Paris and an ancient map of the world. You can wander from floor to floor learning about the different artifacts and how Neruda lived, seeing his bedroom, living room, and writing study, all of which offer expansive views of the ocean and city. Each room and item offers insight into the unique life of one of Chile’s foremost writers, who, in addition to his poetry, had an impressive career as a diplomat. 6. 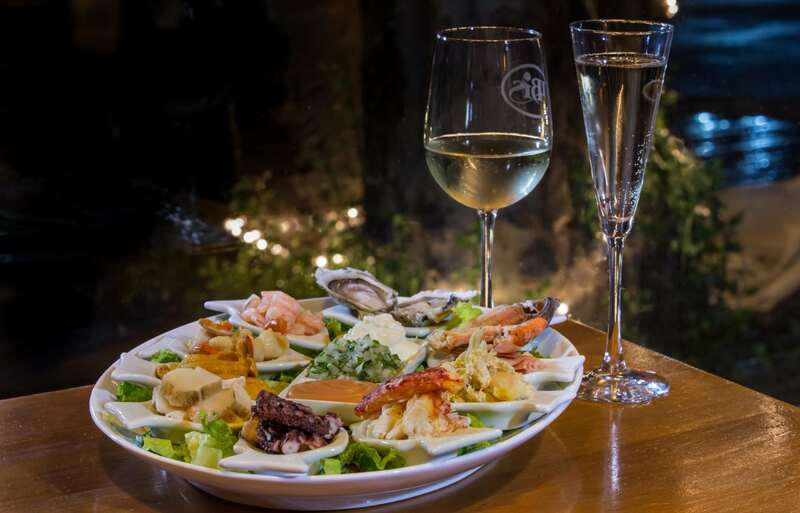 Enjoy some fresh Chilean seafood in the port district – With more than 4,300 kilometers of coastline, Chileans know how to do seafood especially well. As a famous historic port city, Valparaiso is chock-full of restaurants and diners – many dating back to the city’s heyday in the late 1800s and early 1900s like Bar Cizano – that serve up fresh, delicious Chilean classics year-round: machas con parmesan (clams with parmesan); chupe con centolla (savory crab pie, made with crab, cheese, cream, and bread); paila marina (Chilean seafood stew); sea urchins, and catch of the day fish prepared every which way. Just into any restaurant in the port neighborhood and pair your meal with a glass of white wine: you won’t be disappointed.